What a fall from grace that has occurred at The Clinton Foundation. They are hemorrhaging money. This crooked organization has gone from being a shot caller to begging for buttermilk. I fully expect to see Hillary and Chelsea being pimped by Bill Clinton in the near future. It will be interesting to see if past Clinton Foundation donors will continue their generous giving in the years to come. Hillary’s shocking defeat in the presidential election means that no member of the Clinton dynasty currently holds, or is running for, a powerful government position. Because of demise of the Clinton brand, the Clinton Foundation resorts to bottom feeding, at least by their former fundraising standards. These people would have scoffed at such a small fundraiser only a few weeks ago. 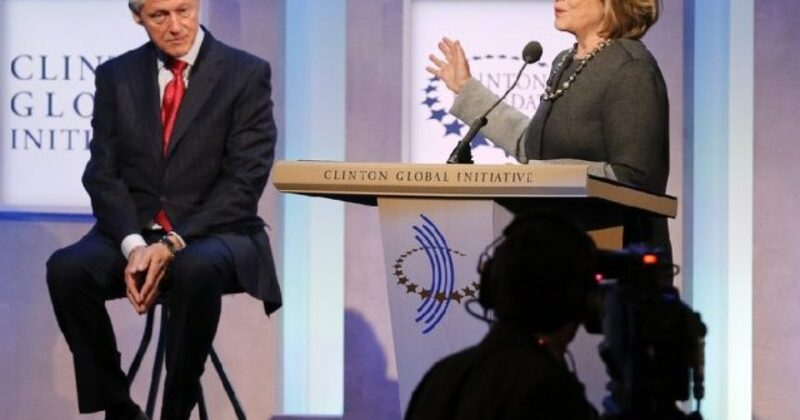 The Clinton Foundation’s donor list represented the Who’s Who of corporate elites, politicos, and countries. The New York Post reports that Clinton Foundation chairman Bruce Lindsey announced in an email to supporters recently that former President Bill Clinton would personally match donations up to $200,000 before the end of the year. The announcement is practically a fire sale. And what’s with the cap of $200,000? Apparently the Haitians no longer have the needs they had only a year ago. Was AIDS cured? $200,000 is not much by Clinton standards, particularly when you consider they pocketed $100+ million in their crooked dealings. If the Clinton’s get 100 percent of the goal, they raise a mere $200,000. For my team’s endeavors, that would be huge. However, my grandfather would say that for pre-election Clintons, $200,000 is essentially “walking around” money. If you slap Hillary Clinton, she’d drop $100,000 down the leg of her pantsuit. If you body-slam her, you’d get $500,000 and a couple of Guatemalan midgets. Bill Clinton has offered $200,000, or half a speech! So what’s happened? Could it be that former donors know they no longer have access, because the Clintons are toast? Holy Mother of Madoff, we all know this foundation is crooked. The only questions are how long will it survive, and when will the Clintons go to prison for racketeering.